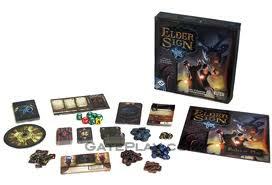 I recently got myself a box of Fantasy Flight’s ELDER SIGN board game. Well, it’s more of a card game, really and more importantly, it’s a nice break away from mini war games for a minute. I have played the original ARKHAM HORROR game only once and really liked it, but it does get complicated. I wanted to have an Arkham game to play, but also needed to have someone to play it with! Thus my main motive for going with ELDER SIGN — it’s a slightly watered down, simplified version of the Cthullu-esque game with fewer rules and more dice rolling (and the dice even have pictures on them instead of numbers for easier game play). My point being, THIS game I may even be able to talk my wife and step-daughter into playing. It’s more approachable for non-gamers so we might have a better chance of sucking them in. ELDER SIGN retains all the fun characters and has a whole stack of creepy scenes and other worlds to explore, though it does sacrifice some of the cool details that we gamers love (most of the items and spells, for example, are simplified down to bonus dice). But it still keeps the fun Lovecraftian horror flavors that we seek on our adventures. I have successfully played a game using three characters alone now (hard to admit I was “playing with myself for two hours,” but i was! 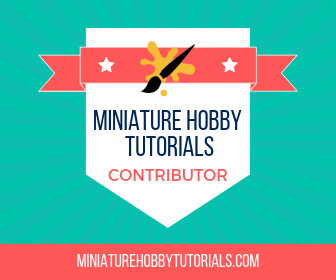 ), so I know it well enough to try and teach the fam and am looking forward to doing so. This “arkham horror Lite” also has another advantage — it takes a lot less time to play. It advertises 1-2 hours, which is probably pretty accurate. So if anyone else is looking for a fun, less challenging, and more cooperative game to play (that’s another advantage i love — you’re all on the same team instead of trying to kill each other, which is nice for a change! 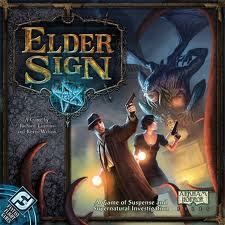 ), give ELDER SIGN a shot. If you like it, you might move up to ARKHAM HORROR, or even start out there if you have a lot of gamer buds to play with. Fun times! Sounds cool! My wife and I enjoy a lot of the more geeky board/card games and have been introducing some of our non-gamer friends to them (my wife is an ex RPG/LARPer.) We’ve started playing some of them with our older daughter (she’s nine.) This sounds like it might be a fun family/friends game and a possible gateway into some of the deeper games. I might have to check it out some time. Let us know how it goes over with your family!